It’s common knowledge that recent smartphones have been more iterative than innovative. That isn’t surprising since falling smartphone prices and tighter margins disincentivise deeper R&D (Research and Development) and force smartphone makers to rely on lacklustre incremental upgrades. This is essentially why the modern smartphone space has been boring of late and littered with underwhelming smartphones that tend to be facsimiles of each other. Vivo, however, is one brand that has bucked the trend. The smartphone maker has leveraged its laser focus on deep R&D to deliver one industry-leading smartphone innovation after another. The Vivo V11 Pro carries forward the same torch of innovation underpinning the Vivo smartphones before it. At the heart of the Vivo V11 Pro’s list of innovation lies the revolutionary new 2PD dual pixel technology. This new advancement comes right from Vivo’s R&D labs and significantly improves the V11 Pro’s onboard camera. It works by cramming in a whopping 24 million photosensitive units onto the camera sensor. These 24 million photosensitive units combine to form 12 million dual-core pixels. While the science behind the 2PD dual pixel technology is too complicated to explain within the scope of this article, but it basically performs accurate phase detection for super fact focusing. However, the most remarkable aspect of this technology allows the Vivo V11 Pro’s camera to capture images with the accuracy of human eyes and hence capture more details while also acquiring images as with the speed and accuracy of human eyes. How fast you ask? Well the 2PD dual pixel sensor equipped Vivo V11 Pro can focus images as fast as 0.03 seconds. That’s orders of magnitudes faster than the blink of an eye. Next up is easily a Vivo innovation that has had more profound impact on smartphones as we know them than anything else. The in-display fingerprint scanner technology pioneered by Vivo is in its fourth-generation avatar in the Vivo V11 Pro and it has singlehandedly solved the problem of ergonomic fingerprint placement in modern bezel-less displays. That means, you don’t have to fumble around with a rear-mounted fingerprint reader like other smartphones. The Vivo V11 Pro’s gorgeous 6.4-inch hides an invisible, yet easy to access fingerprint reader that authenticates surprisingly fast. What’s more, the 19.5:9 ultra-wide aspect ratio screen not only works great with movies and videos, but it also makes the phone narrow and hence easier to hold. 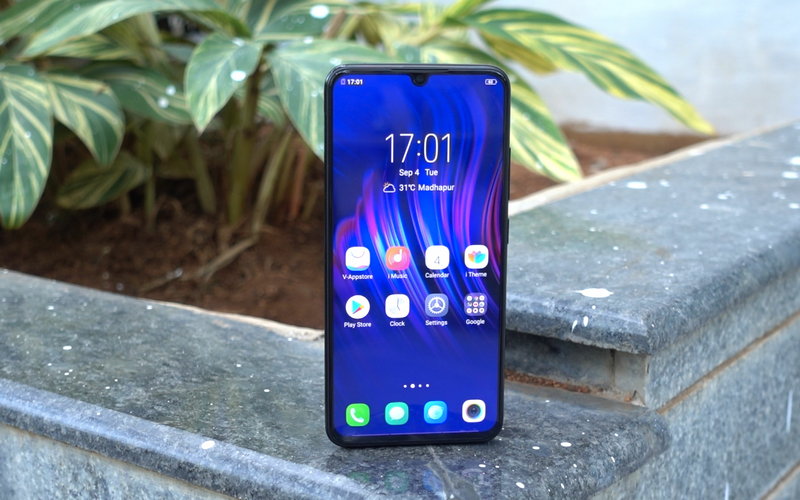 However, the Vivo V11 Pro isn’t just about design elegance and killer features. It’s also packed to the gills with raw, uncompromised processing power. Powered by Qualcomm’s new Snapdragon 660 SoC that’s bolstered with the Artificial Intelligence Engine. Apart from a huge laundry list of AI improvements the processor brings to everything from battery optimisation to camera, the new Kryo 260 processor is a whopping 20 percent more powerful than the previous generation chipset. The Adreno 512 GPU is one of the fastest chipsets for gaming in its segment and a serious 30 percent horsepower improvement for 3D graphics. This makes the Vivo V11 Pro one of the fastest smartphones in its segment. Combine these killer features and specifications of the Vivo V11 Pro with great design as well as built quality and innovative features such as IR face unlock that allows the smartphone to be face unlocked even in pitch darkness, and you have a smartphone that goes beyond incorporating lofty specifications just for the sake of it. The Vivo V11 Pro provides great hardware and innovative features that genuinely improve the smartphone user experience and enrich your day-to-day life.